As the leader in premium bathrooms, Keuco is launching a new product from the Keuco Royal Match range. This time, in addition to the classic on-wall model, an elegant semi-recessed model is available. The Keuco Royal Match -semi-recessed mirror cabinet as the concealed storage solution is going to amaze guests and bring your bathroom up to an even higher standard. What is special about the Royal Match semi-recessed model? The unique function of the ROYAL MATCH is the LED lighting on the sides. Regardless of whether the mirror doors are closed or opened, the lighting illuminates the reflective surface and ensuring perfect lighting at each angle. The long LED’s on the sides supply uniform and glare-free illumination of the face with their efficient 3000K warm-white light. Keuco Royal Match provides an individually organisable storage space. 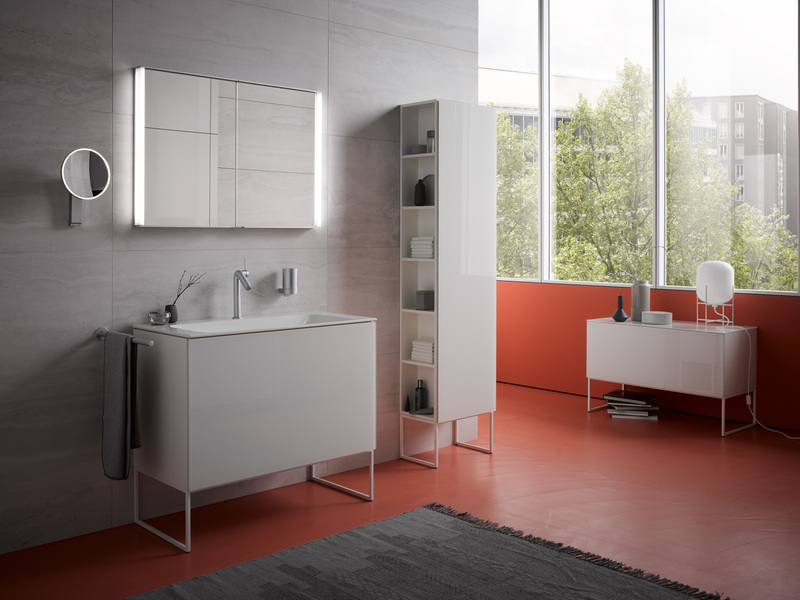 And its appealing design makes the ROYAL MATCH from Keuco the universal mirror cabinet for every bathroom. Once installed, the semi-recessed mirror cabinet appears to be a slim illuminated-mirror from the outset, projecting only 67mm out from the wall. The generous storage space is cleverly concealed in the wall out of sight, avoiding any bulky units overhanging your washbowl. Furthermore, thanks to the shallow installation depth of only 82 mm, it is also suitable for thin drywall. The ROYAL MATCH features an exclusive white-lacquered rear glass panel. The central divider of the glass shelves allows you to adjust the heights of the shelves, to organise things according to your personal needs. The electric sockets inside are just as practical as the pivoting doors which are mirrored on both sides, which give a generous all-round view while primping and grooming! The high-quality aluminium edges emphasise its elegant design. The ROYAL MATCH has a premium aluminium body that guarantees a long lifespan and is simple to take care of. With its modern and rectilinear design language, which balances with almost any style. The ROYAL MATCH mirror is a visual treat in any bathroom. KEUCO guarantees the availability of spare parts for 10 years. If you have any query or need further information, please contact UK Bathrooms sales team.